The big Dads Day is right around the corner. SO FAST around the corner!! Thankfully my husband doesn't read my blog. Ahem.... at least I hope he doesn't read THIS one. Cause it's ALL ABOUT FATHER'S DAY! I was recently approached by a company that has one of the most unique Dad's Day ideas out there. They are called 'Flatten Me'. They take an image of a person and put it on a shirt. But the best part is they super-impose them on characters! 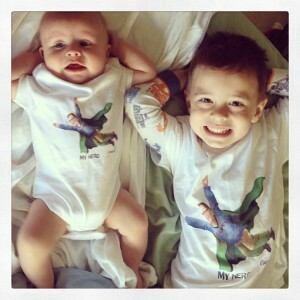 So, this one-we went with the 'My Hero' shirts with Daddy-O. Be sure to check them out at www.FlattenMe.com. They do it on many different things-like books, wall art, cards and even water bottles. But my fave is the shirt for this holiday! Check them out on Facebook & Twitter too.